San Francisco: Determined Productions, 1979. Book. Illus. by Charles M. Schulz. Fair. Pictorial Board. 12mo - 7 in by 7 in. square. Spine backing cut along top board but still attached. Rubbing along edges of glossy red pictorial boards. Repairable and satisfactory as a reading copy for a child. About 150 unpaginated pages on glossy stock. No writing or markings, binding still sturdy. An expanded edition of the 1965 original. 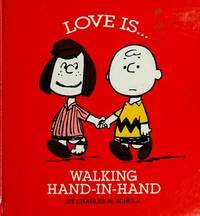 Each full page color cartoon is paired with a one-sentence "Love is...." caption on the facing page. Charlie Brown, Lucy, Snoopy and others from the Peanuts gang are included..